DELE, OPI, D.I.E., CCSE…what?! – This Guide will Negotiate You through the Jungle of Options when It Comes to Spanish Certifications. A free Spanish level test or an official Spanish degree? Online? Offline? Modular? Evaluate your skills in Spanish by choosing the Spanish certification that is just right for you. You want to test your Spanish skills or get certified in Spanish: Where to begin when it comes to Spanish proficiency tests, placement tests and Spanish certificates?! Keep calm! We will help you get organized! What to Consider while Looking for the Right Spanish Proficiency Test? No matter what your goal is, there is a matching Spanish proficiency test for you! For a basic Spanish quiz online there are lots of quick and free options available. To earn an official and valued Spanish language certification you will have to invest some time and money. So it is really important to pick the right one! You may not want to depend on certain locations or dates, when taking your Spanish proficiency test, and would rather take an online exam. Living in a digital world, there are options to complete a placement test online. Most of the Spanish language certifications have in common that they consist of different sections. Usually you will have to prepare for reading, writing, listening and speaking. It may make sense for you to take the parts separately. To prove your level of Spanish fluency, for example. This is possible with language tests which are modular. Regardless of how many sections you take, you can get the results of your knowledge in Spanish separately on each one. To evaluate your language skills, most Spanish exams will rank your results according to the CEFR standards. The Common European Framework of Reference for Languages ranks your ability to communicate in a foreign language in several levels. The broad levels “Basic User”, “Independent User” and “Proficient User” can be further divided into the levels A1 to C2. The Spanish proficiency levels are defined through ‘can-do’ descriptors. You can check them here, using the self-assessment grid. It is provided by the Council of Europe. In case all you want to do is a quick vocab or Spanish grammar check to evaluate your level in Spanish, there are lots of free options to do so online. LingQ provides a fun version of a Spanish vocabulary test to estimate the amount of words you know in Spanish. Several free Spanish level tests will quickly help you to estimate your level in Spanish online, according to the common CEFR levels. Due to the mass of options, our teachers evaluated two basic Spanish level tests for you, which are online and free. The lengalia placement test will let you start right away and test your skills in Spanish according to the CEFR language levels. If you pass the section representing the Spanish level A1 the system will allow you to go on with the following one (A2) and so on. To take a more reliable placement test online, you register with your email address. The Instituto Cervantes then provides a more detailed, free Spanish test online-version. What is the Instituto Cervantes? Find out here. It consists of Spanish grammar questions and basic understanding of short Spanish texts. DELE stands for Diplomas de Español como Lengua Extranjera (Diplomas of Spanish as Foreign Language) and it is a worldwide recognized title of Spanish proficiency. It is provided by the Instituto Cervantes, which assures its value as an official Spanish proficiency test. The DELE exam differs from other Spanish certificates. Before you take it, you decide on a CEFR level which you want to certify. Once you successfully completed the DELE certification is valid for a life. The diploma does not have any restrictions when it comes to nationality or age. In case you are under 16 you will need your parents to handle the registration process for you. The costs for the exam reach from 108 Euro for the A1- to 207 Euro for the C2 level-proficiency test. There are more than 1000 examination centers in over 100 countries, which will let you participate in the DELE exam. Here at FU International Academy in Tenerife it is possible to take the exam at least every other month. For exact dates and prices check our blog post: DELE 2018/2019 – The ultimate Guide. It is also obligatory to pass this exam level A2 or higher in order to become a Spanish citizen. The SIELE (Servicio Internacional de Evaluación de la Lengua Española or International Assessment Service for the Spanish Language) is an online Spanish degree. The official examination centres, like our FU International Academy in Puerto de la Cruz, Tenerife, certify your level of Spanish proficiency through digital means. The digital process makes it fast and easy to register for the exam, take the test and finally receive your results. Also, thanks to the online procedure, you do not depend on certain dates. The online Spanish degree is only valid for two years. SIELE is a multi-level exam. Each task in each test presents a different degree of difficulty. The final results will rank your Spanish skills from level A1 to level C1 according to the CEFR. The online spanish certificate is modular. You can take the four modalities of the Spanish test separately (S1 Reading & Listening; S2 Reading & Writing; S3 Listening & Oral; S4 Oral). The prices of the single modules differ from 55 to 100 Euro. 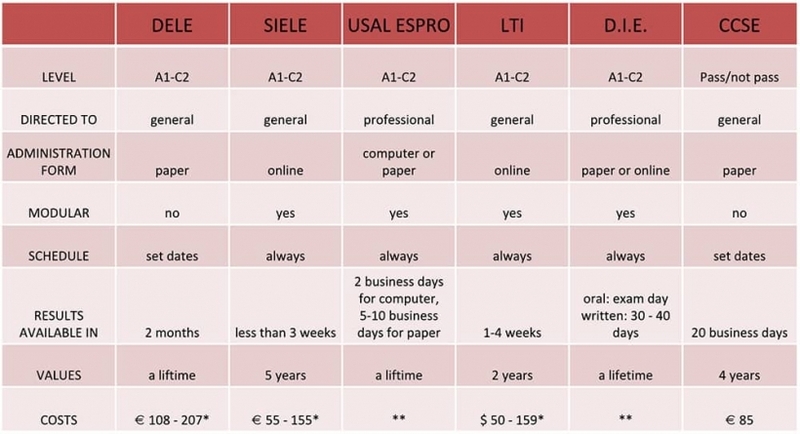 It is also possible to take all sections at once (SIELE Global) for 155 Euro. Exact prices and an explanation how to enroll for the online exam are displayed in our blog post: SIELE exam. In 2017, Cursos Internacionales de la Universidad de Salamanca and LanguageCert have joined forces to deliver professional Spanish language examinations worldwide. The two organisations have cooperated to continue offering the Spanish placement test BULATS tests (Business Language Testing Service, which will run out in 2019) under the new name LanguageCert USAL esPro. The test can be taken by several examination centers around the globe in a paper or a computer-based version. The prices and dates may vary between the centers. Since the test is quite new, not all the exam centers available can be found in the system. In case you cannot find one close to you, they have a great customer support, which will help you out with information in no time. The EspPro certificates your skills according to the CEFR standards and will let you take parts of the test individually. You can choose between listening and reading, writing or speaking. Within two business days, the electrical results will be reviewable while it will take up to five to ten days for the paper test results. The Espro is valid for a lifetime. The Spanish certificate is well recognized and gives access to all Spanish Universities. The Association of Language Centres in Higher Education (ACLES), CRUE Universidades Españolas (Conference of Chancellors of the Spanish Universities) and Mesa de Certificación Lingüística para el Español como Lengua Extranjera (Accreditation Commission for Spanish as a Foreign Language) accept it as a proof of Spanish language proficiency. LanguageCert itself grants awarding organisation recognition by the Office of Qualifications and Examinations Regulation (Ofqual), a non-ministerial department that regulates qualifications. The official tests like DELE and SIELE may also function as a college spanish placement test. Language Testing International (part of ACTFL) will let you schedule your exam date anywhere at any time. As a digital test provider you are able to fulfill even the oral test over the phone and your computer. The American organization ACTFL aims to improve and expand the teaching and learning of all languages at all levels of instruction. It counts more than 12 500 foreign language educators and administrators. The members reach from elementary through graduate education, government and industry. The test sections are modular and prices per section rank between 50 to 159 Dollars. The modules duration vary between 30 (oral) to 80 (writing) minutes. You can enroll directly on their homepage by choosing your desired date and time. Test ratings can be available as soon as the same business day, dependending on the specific tests and clients needs. Test results are valid for two years. Next to the CEFR scale, LIT will also give you the option to show your ranking through the ACTFL scale or the ILR scale, which you can read about here. Through the OPI you can earn up to 12 college credits. The CLEP (College Level Examination Program) is a group of standardized tests created by US-College Board. The amazing thing about it: It allows you to earn college credit outside the classroom! 2 900 colleges in the US grant college credit, if you pass the CLEP exam with a score of 50 (out of 80) or higher. The number of credits may vary in between the schools. Obviously, the higher you score the more credit you are going to earn. You can choose from more than 1 500 test centers across the US to take the Spanish CLEP test. You can save a fortune of tuition fees by taking the CLEP exam in Spanish! Taking the CLEP exam in Spanish, you may choose between Spanish Level 1 and 2. Depending on the test level it measures skills acquired through two to four semesters of Spanish language study. It contains approximately 121 questions to be answered in approximately 90 minutes. There are two listening sections and one reading section. With costs of 87 Dollar per test for 6 to 12 credits it will save you a huge amount of tuition fees! Registration is possible on the College Board’s website. Sample questions presented by the College Board will give you a feeling of what awaits you in the test. Some of the content may be covered by an AP Spanish course you might have had. But the advice is to study with more than one Spanish textbook. To get the most out of your Spanish CLEP test register for the best online Spanish course now! Together with DELE and SIELE the D.I.E., Diploma Internacional de Español (International Diploma in Spanish), is one of the most respected and recognized Spanish language certifications in the world. It is held by the FIDESCU Foundation, which is part of the Ministry of Education and Culture. The foundation aims to promote the Spanish Culture at national and international level. The exam was developed in cooperation with the Universidad Pontificia de Salamanca. The D.I.E. test will let you take the Spanish exam on a certain topic. This way not only can you prove your language skills with it, but also your knowledge in Spanish in a specific field, like business, tourism or health. The D.I.E. test consists of an oral and a written part. The sections test your basic understanding, fluency, grammar correction, vocabulary and pronunciation. It is possible to certify your skills in either of the sections or take them together. You can earn up to 100 credits. 65 are needed in order to pass the exam. The diploma will be awarded with a distinction when a candidate reaches 85 credits or more. To optimize your Spanish in a certain topic, join one of our specific courses! The FIDESCU foundation will also rank your results according to the CEFR guidelines. Exam results for the oral part can be reviewed the same day the test has been taken. Results for the written part will be processed by the FIDESCU within 30 to 40 days. The diploma itself will be send to you within 60 to 90 days. You can take the D.I.E. at several examination centers around the globe, which are listed on the FIDESCU website. For the exact prices and exam dates you will need to contact your desired examination center. The Spanish Chamber of Commerce holds several Spanish proficiency tests for employment. These will let you examine your qualifications in Spanish for an economical cause. The official Spanish chamber of commerce for Germany in Frankfurt provides the Certificado de Español Comercial (CEC) and the Diploma de Español Comercial (DEC). Depending on your level of competence, you will either take the certificate (basic) or the diploma (advanced). To apply for either of them you first need to certify a certain level of general Spanish skills. You can do so by, for example, taking the DELE exam with us. The fee for the CEC and the DEC are about 300 Euro each. Inside Spain similar degrees are hold by the Spanish Chamber of Commerce and Industry in Madrid. Besides the degree for business Spanish (Certificado/ Diploma de Español de los Negocios) there are degrees which prove that you are qualified in Spanish in the field of tourism or medicine. You can check all of them here. To become a Spanish citizen it is obligatory to pass the CCSE exam. CCSE is short for prueba de conocimientos constitucionales y socioculturales de España (test of constitutional and cultural knowledge of Spain). In this case speaking Spanish won’t be enough. To become a Spanish Citizen you need to pass the DELE exam level A2 or higher as well as the CCSE. As well as the Spanish language you will need to study the Spanish constitution, society and culture. But do not worry. The Instituto Cervantes provides old CCSE exam papers for you to review. You can also download an overall handbook on how to prepare for the CCSE. The test is divided into two parts. 15 questions will check your knowledge of the government, legislation and the citizenship in Spain. 10 will contain topics about Spain’s culture, history and society. The test duration is 45 minutes. It will cost will you about 85 Euro, which is valid for two exam sessions (in case you miss or fail the first session). Test results are published approximately 20 days after the sitting date by the Instituto Cervantes. A passed CCSE test will be valid for four years. You need to be at least 18 Years old to take it. It goes without saying that the Spanish proficiency tests listed above are not the only ones out there. The collection summarizes the top test our certified teachers would recommend on each topic. 358 queries in 3.691 seconds.